Glyptapanteles is a genus of parisitoid wasps, and we all know how much fun they can be. Female wasps lay their eggs inside certain caterpillar species. 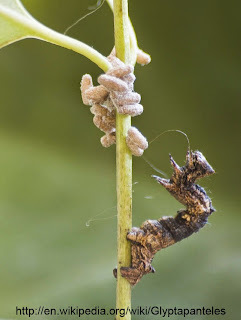 The juvenile wasps grow inside the caterpillar feeding off it but not damaging it too severely. The caterpillar behaves normally as the wasps develop. Once they are ready to enter their cocoon phase the wasps burrow out of the caterpillar and build their cocoons. 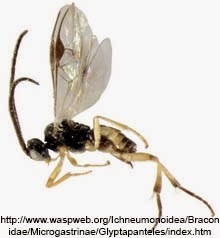 But one or two juvenile wasps sacrifice themselves and stay behind to take care of things. Once the others have left altering the brain of the caterpillar making it stand guard over the cocoons of the other wasps. The caterpillar will even cover the cocoons in protective silk, but mostly it just stays still over the top of the cocoons. If anything touches the caterpillar it springs into action doing everything it can to scare or fight off the potential predator. The caterpillar will eventually die of starvation as in its new brainwashed state it has no desire to eat. Watch it happen here.